2012 Semi Truck Tandem Axle Daycab International Prostar Day Cab WOW! 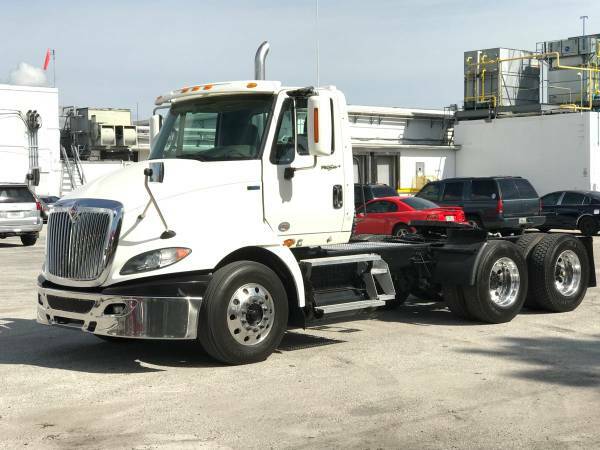 For Sale LOW MILLAGE DAY CAB: 2012 International Prostar + Day Cab International Engine 10 Speed Eaton Fuller Ultrashift Aluminum wheels Cold Air Newer virgin tires UNITS ARE PRICED THE SAME! COME CHOOSE THE LOWER MILE UNIT TODAY! Available miles are 205k, 418k. 512k All trucks run well with no major issues. Selling one by one or as a fleet. Discounted price for multiple unit purchases. Please call 1 (727) 455 157.6 if interested. Thanks for looking. If you’re thinking about buying a good quality used Day-cab, or used semi truck like the Peterbilt 387 or the Volvo VNL 670, you have to come and take a look at our International Prostar Daycab. The powerful 430 HP International Engine combined with an Eaton Fuller Ultrashift 10 Speed transmission, makes driving a truck to seem like a walk in the park. If you want to make it in the trucking industry, you need something that offers you enough comfort, space, and safety to let you drive for days, but doesn’t sacrifice fuel mileage, and won’t break the bank on maintenance costs. Trucks aren’t what they used to be. We all remember the classics. Trucks like the Freightliner Classic, the Peterbilt 379, and the Kenworth W900 defined the word truck. They showed us what it meant to be a truck driver. And they’re fine machines, but even with those legendary C15 Caterpillar engines, you know those tall, flat fronts aren’t going to cut it anymore. Not when gas costs what it does. 8 miles to the gallon isn’t going to keep you in business very long. The problem is that most companies buy cheap workhorses. It’s a competitive industry, and they want to keep maintenance costs low, and we understand. But the reality is that trucks like the Freightliner Columbia, Century, and Mack trucks might be reliable, but they’re not going to win any awards for comfort, and that’s what an owner-operator is going to need if he’s going to be on the road for weeks at a time. That’s why we focus on trucks you can rely on, trucks that you’ll actually want to drive. Vehicles that give you the perfect balance of quality, economy, safety, and comfort. Come explore our stock, including the Freightliner Cascadia, the Pete 387, the International Prostar, or the Volvo 780. Don’t settle for less.